This brewery is already expanding its footprint in the Queen City. Catawba Brewing Co. has signed a deal for an additional 4,300 square feet in Charlotte’s Belmont neighborhood — less than a month after opening its doors. Inside the private event space at Catawba Brewing Co.’s Asheville location in downtown Asheville. The new space sits adjacent to the brewery’s $1.6 million, 10,000-square foot brewery and taproom at 933 Louise Ave. That location was formerly home to a Kellogg’s bakery facility. “We knew we didn’t have an ideal private space, and we knew this space could be good,” says Billy Pyatt, co-founder of the Morganton brewery. There’s a need for unique private event space in the neighborhood and Charlotte, says Catawba Creative Director Mary Mayo. 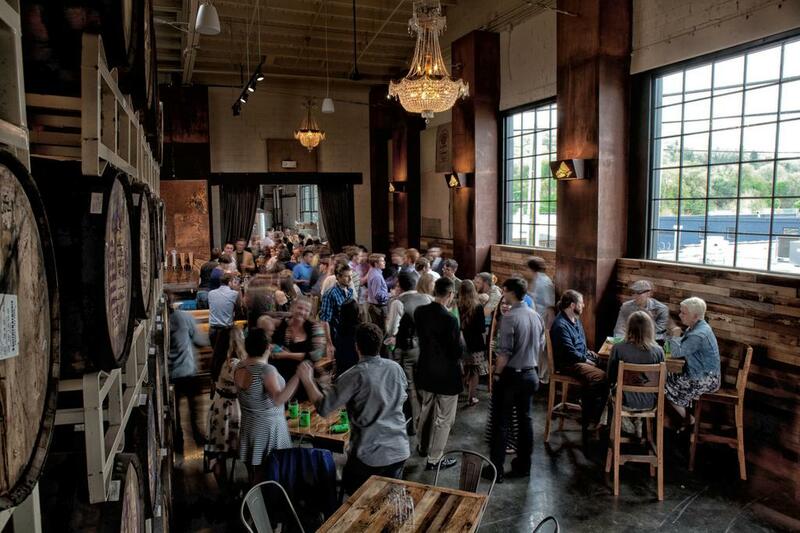 “There is a shortage of private event space in the brewery setting. We really want to occupy a niche,” she says. The goal is to create a setting that is elegant, over-the-top and memorable. Mayo envisions creating a roughly 3,500-square-foot ballroom that offers a mix of rustic and industrial chic. Walls will be lined with 300-plus barrels — used as part of Catawba’s barrel-aging program. Think brown velvet curtains, chandeliers, existing barrel roof and a detailed wood bar with a header and carvings. Space will be set aside for catering and a dressing room. Mayo sees the space serving as a music venue early in the week with well-known, but smaller-scale bands. Corporate events such as quarterly sales meetings can run throughout the week. And weekends largely will belong to bridal parties and those types of gatherings looking for a unique space. “In a lot of ways, breweries have become the new community centers,” Mayo says. That space should be ready to host its first events by late October. Mayo is offering a 50% discount for those that book before the venue opens. Otherwise, prices vary based on the day of the week and time of event. Foard Construction is the general contractor on the project. Originally posted in Charlotte Business Journal by Jennifer Thomas on June 2, 2017.